Now we’re not trying to claim some great breakthrough; an invention that will have the world beating a path to our door. But by the same token, this is a damn useful instrument that’ll cost you nearly nothing and has plenty of automotive uses. The need came about because I was building a small vehicle with suspension. At the front, double unequal length wishbones were being used. Sounds conventional – and it is. But unless you’ve ever actually built something like this from scratch, you won’t realise the complexity! 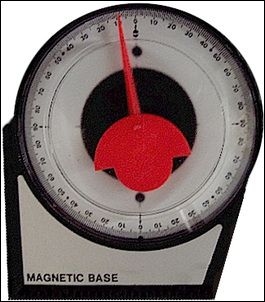 So basically what was needed was an accurate clinometer, or as the hardware stores call them, an “angle finder”. Trouble is, while you’ll find these tools relatively easily, they’re all designed to measure angles with an accuracy of about plus/minus 5 degrees. Simply put, the tiny, close-together markings don’t allow you to measure angles with any resolution at all – so in automotive use, where the difference between a camber of 1 and a camber of 4 degrees is major, they’re nearly useless. So what to do? The answer is to make your own instrument. Now we’re not talking here of a professional tool that will last decades, taking the rough and the smooth. Instead what’s being covered is an instrument suitable for a few uses – then when it’s getting grubby, you make another. For the last item I used a thick washer. Decide on what range of angles you want to measure. Don’t go above this range by saying, “Hey, a 90-degree instrument could be useful, so I’ll say that” – when in fact you want to measure a max of 10 degrees with accuracy. 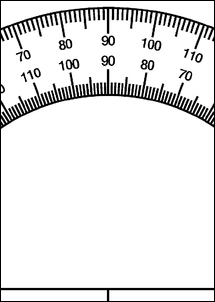 Then do a web search for 'printable protractor', downloading the file and then enlarging it as required with the image manipulation software so that just the range of angles you want is printable on a vertical A4 page. Place a nail at the upper inverted T from which the angles are being measured, then attach the brightly colour wool or string to the nail. Leave sufficient length of wool so that it goes across the numbered scale and then attach the flat weight. Depending on how much you enlarge the image, you’ll be able to accurately measure angles down to one-quarter of one degree. It’s easy to use the device to find out good information. Cut a (straight!) piece of timber that just fits across the lips of your wheel rim, not touching the tyre. Place the timber across the wheel and then place the side of the instrument against the timber. Orientate it vertically so the woollen thread is just free to move and then read off the camber of the wheel. 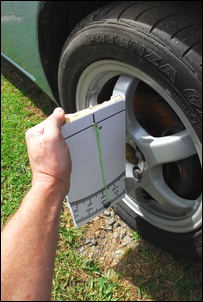 In some cases, as shown here, the clinometer can actually be placed against the flats of the alloy wheel. Use some common sense when reading the gauge. Holding it so that the side is vertical will show 90 degrees – or in other words, 0 degrees away from vertical. If you’re measuring change (rather than absolute angles), mentally nominate the starting angle (whatever it is) as zero and work from there. For example, you might be measuring camber change. If the wheel measures 100 degrees at normal ride height, 95 degrees at full bump and 105 degrees at full droop, you know that there’s a 10 degree camber variation across the suspension travel. When using the tool, tilt is slightly so that the washer is free to move then, when you want to take the reading, tilt the board backwards a little so that the reading is held. This works very well in practice. Nothing earth-shattering but near zero cost and very, very effective. You’ll be pretty lucky to pick one of these up at the local secondhand store, but take a look at this clinometer! Photographed at the Australian War Memorial, it was used during WWII in the construction of aircraft. 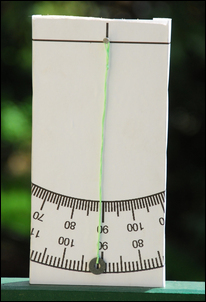 The ‘Austen Universal Clinometer’ incorporates a bubble level, pivoting weighted pointer and a vernier degree gauge allowing the measurement of angles down to fractions of a degree.